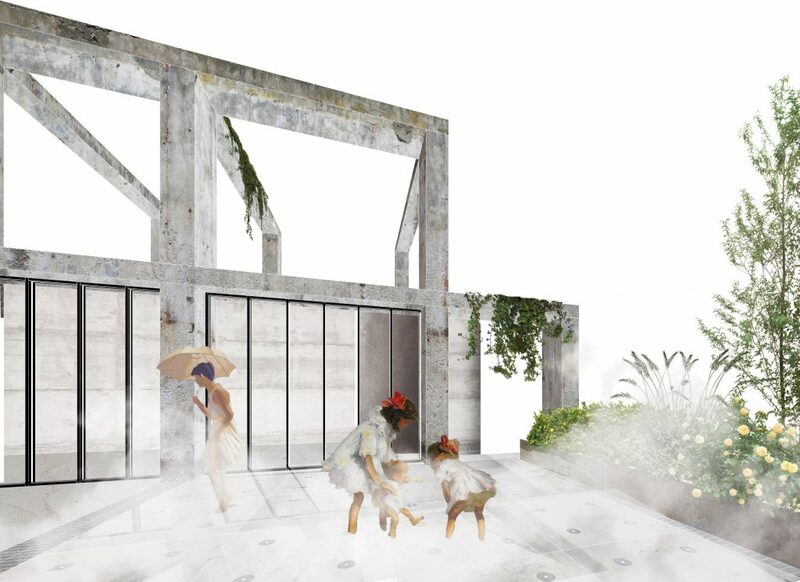 The project is situated in the former “Ada Frigor”, a refrigerator factory in the sub-urban neighboorhood of Rogoredo, Milan. The building has suffered many abuses after the company when bankrupt some decades ago. The project draws upon the impressive scale and classicism of the structure. In particular, the demolished ground floor which has left the concrete pillars standing alone in a massive space reminiscent of a classic hypostyle hall. In total abandonment nature has overcome architecture . The design process is based on enhancing what was left and taking inspiration from what was found on the spot, water. 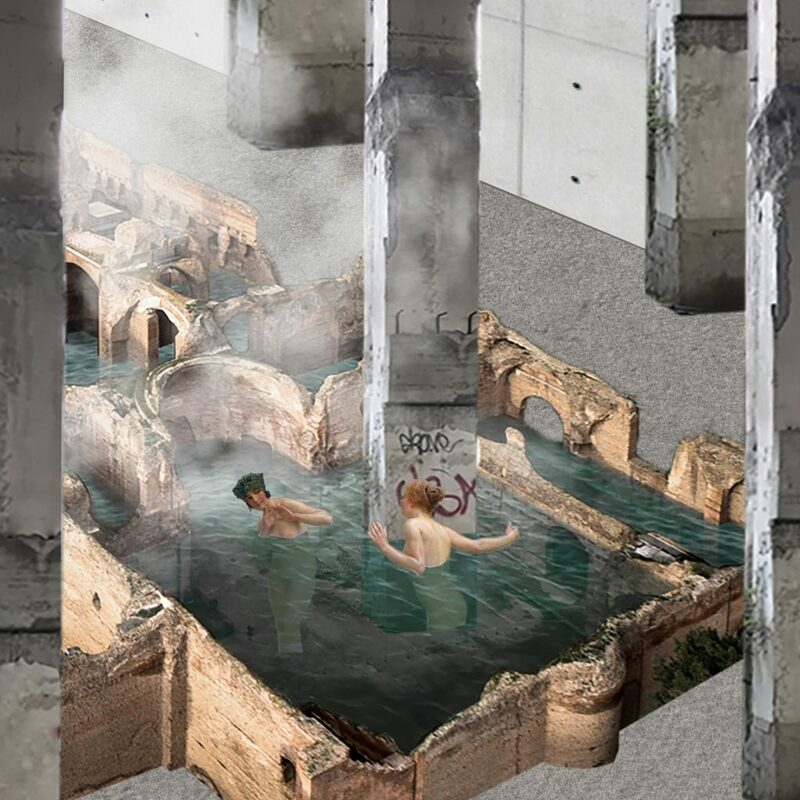 As such the project develops as a thermal bath with the idea that water was the palliative element able to take care of both: the damaged building and the human body. The thermal bath is designed with the minimum need and everything added doesn’t affect the original builing leaving its unusual beauty as it is. 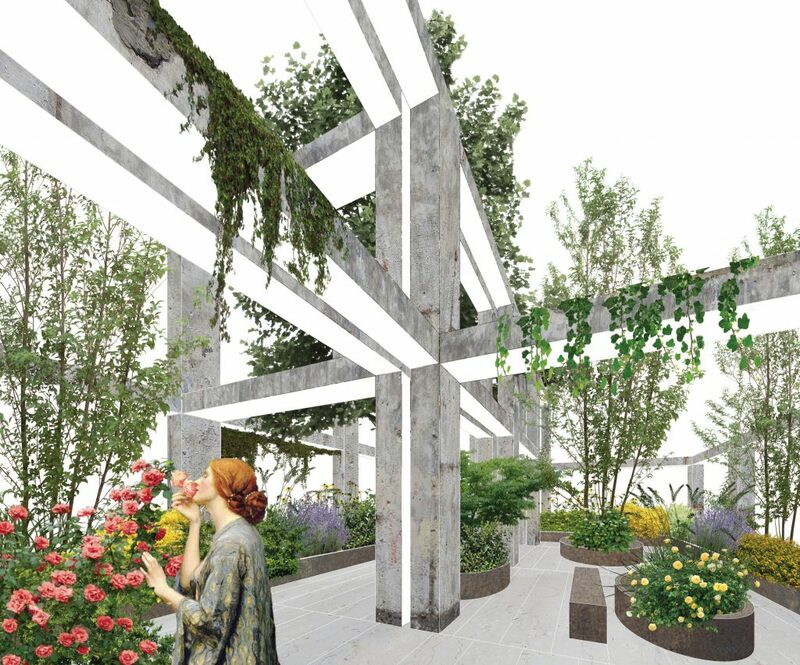 Walls and pillars are left untouched and some objects found on the site are transformed for the new use, like shipping containers as saunas, to recall the former industrial atmosphere and create a new place of wellness. The project took place within the interior architecture studio during our bachelor at Politecnico di Milano. The purpose of the studio was to imagine a new life for a former refrigerator factory in the milanese suburbs that is going to be demolished this year in May. 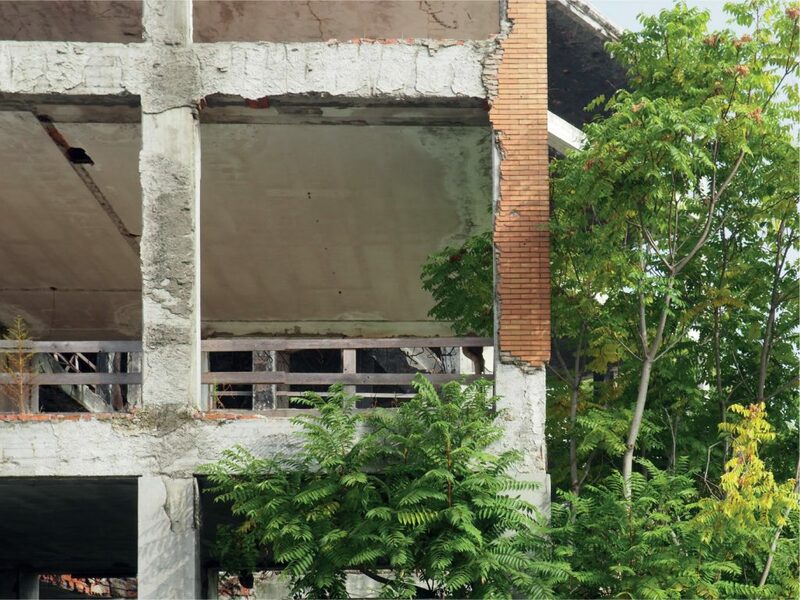 This building has gone through a lot after the company failed during the last decades because it has been the target of several commercial speculations and some attempts of reuse as an apartment building: that’s why it had its walls and some slabs demolished leaving just the concrete structure standing. When we first visited the site we imagined the building as a fascinating ruin which needed to be taken care of so our purpose was to give new life to the building preserving its precarious beauty. When visiting the site what tools did you use to document this? The site was quite tricky to visit because the building is abandoned and we weren’t allowed to get in. This turned out to be very interesting and we ended up discovering the building from odd viewpoints such as through holes in the fence or climbing the perimeter wall so we didn’t have any other way to document but through photography. How important were the initial digital photo montages for the development of the project? They have been crucial for the outcome of the project. We made those photo montages from some hints we found on site. 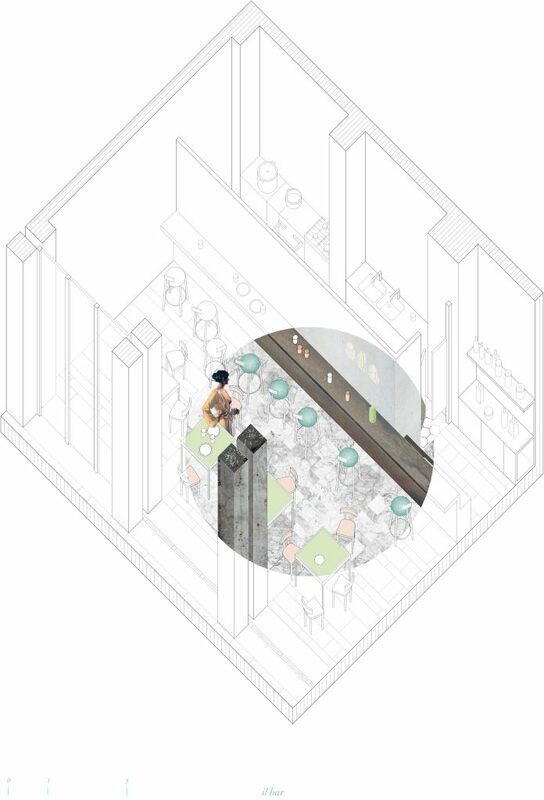 In particular we took inspiration from the flooded ground floor and the wild greenery that was growing all over. Water and plants colonised the building and its surroundings creating Gilles Clément’s third landscape. Also the scale of the building and the repetition of pillars reminded us of a hypostyle hall and some ruins in a Piranesi’s etching. These elements and the new environment became the starting point for our project. The aim was, on one hand to regenerate the old warehouse, and on the other hand to improve the neighborhood and its citizens’ life. 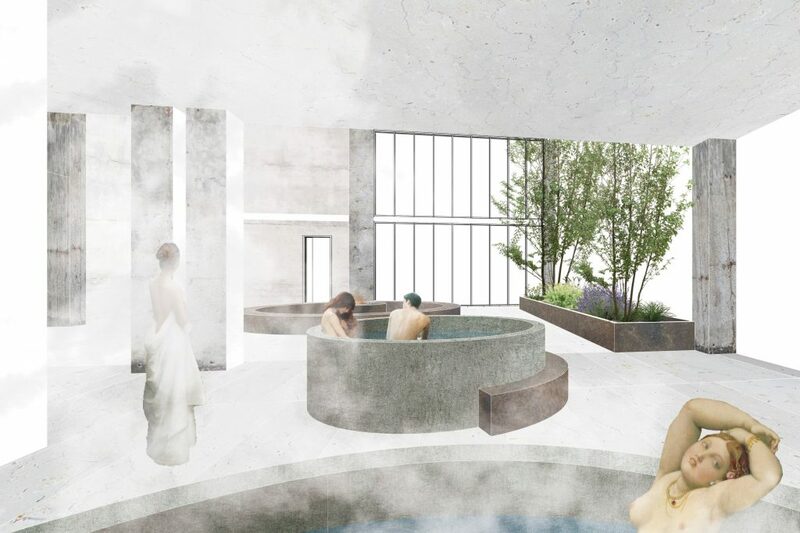 That’s why we designed a thermal bath; we thought of water as a palliative element which could take care of the damaged building and the human body. 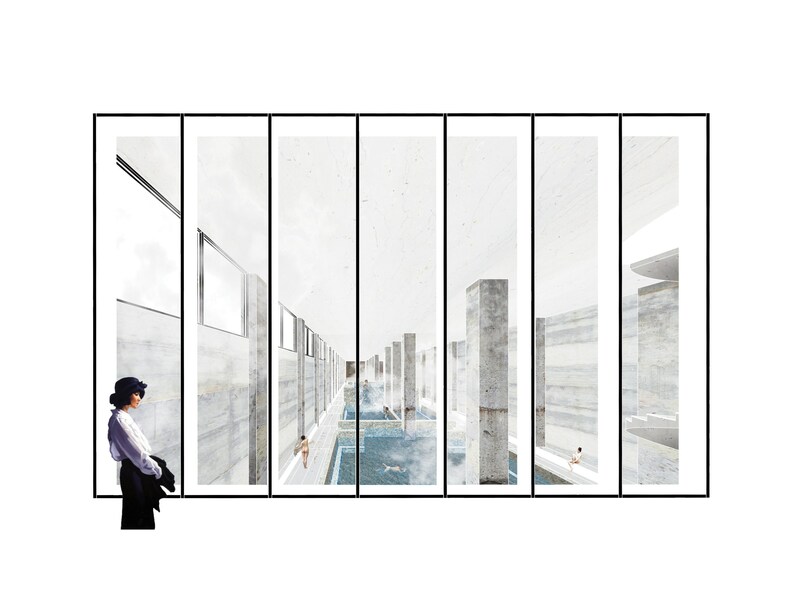 We wanted to design a timeless space where the classical typology of the roman thermal baths could meet this contemporary industrial archeology. How important was the plan? The plan was very important especially at the beginning of the design process. It helped us understand more about the building: its geometry, its proportions, its modularity, the relations between the parts. Through the plans we found out that the building was more complex than we thought the first time we saw it. We started designing plans because we could keep control of dimensions and proportions much more easily but we ended up giving more attention to perspectives and axons as they could show immediately the project as a whole. What is the effect and purpose of the coloured circle zoom within the axons? How important was it to highlight aspects of these drawings? When we were drawing the details and the axons we wanted to keep both the technical drawing and the more evocative one so we ended up highlighting the most interesting portion of the scene with a circle zoom which displays better the materials, the colours, the porosity, the texture of the atmosphere we wanted to create. 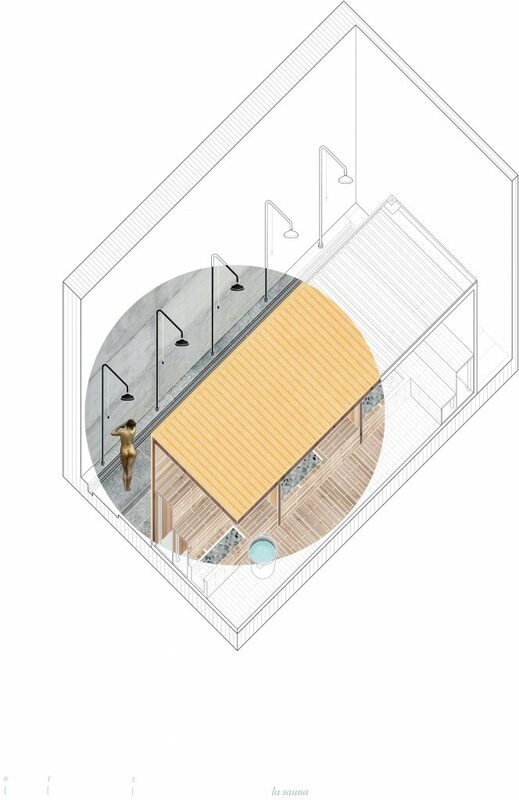 In particular the circle zoom shows a glimpse of how we imagined the spaces could come alive through the cut outs and the little details but always keeping in touch with the precision and the impartiality of the technical drawing. When framing the views, what defined the specific moments you chose to reveal? The setting and the point of view were basically defined by the cut outs we wanted to put in. 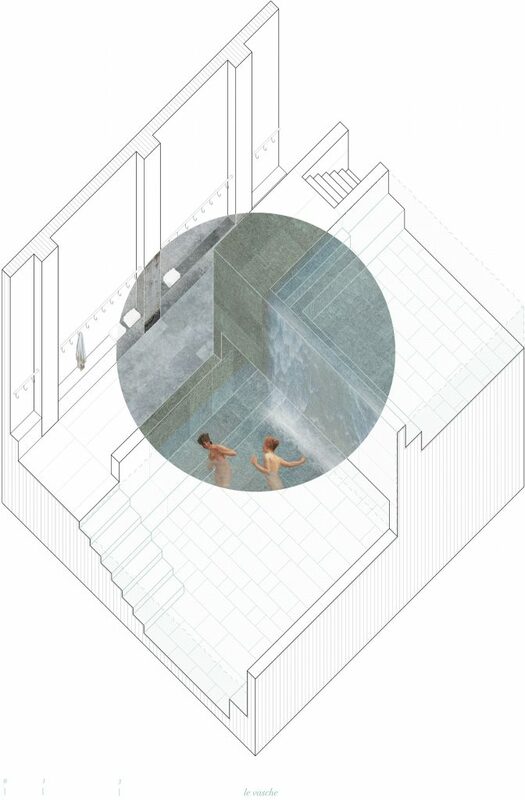 We imagined our spaces as reinterpretations of those paintings we had in our minds. The aim was to make the spaces live through the materials and the character creating a collages of fictions and new realities. What defined the use of the ‘silhouette’ cut outs from recognisable imagery? How does these inform the intervention and space? The cut outs played an important role in setting the tone and the atmosphere in our perspectives. When we were imagining the character of a space, some scenes from paintings immediately came to our minds. We wanted to recreate those scenes in our spaces so we stole the characters from those paintings and we made them live in our thermal bath. The cut outs we used were mostly nudes because we aimed at giving a timeless and classical atmosphere to our contemporary setting. We took inspiration by a big variety of artists from very different periods and styles: Lawrence Alma Tadema, with his roman thermal scenes, was for sure our favourite, but also Ingres, Courbet, Bouguereau, Gérôme, Hopper, Vettriano, Hockney were very fitting. What role did the drawing play as medium in the development of the project? It was fundamental. Through the drawings we could keep control over dimensions and proportions but we also often preferred drawing the perspectives instead of using a 3D model so we could distort the point of view and create more evocative images. Alessandro Bucchi graduated with a bachelor’s degree in Architecture in September 2017 and now he is doing his master in Built Environment and Interiors at Politecnico di Milano and is moving to Brussels in september. He is mostly interested in urban regeneration and dealing with the built environment. Nadia Buelli graduated with a bachelor’s degree in Architecture Design in September 2017. Now she is doing her master in Built Environment and Interiors at Politecnico di Milano and is moving to Hasselt University in october. She is strongly interested in adapting the old buildings in a new context through a contemporary reuse.